So, it's pretty common knowledge that Reimu underwent a pretty major redesign between Touhou 5 and Touhou 6. Out of sheer curiosity; I decided to watch a video on Seihou Project's Cameo of Reimu and Marisa, and noticed a few things. I knew nothing about Seihou beat in mind except the name of VIVIT. The graphics looked rather old. Then Marisa showed up. First thing, she sports a pair of angelic wings instead of her broom in this incarnation. Also Marisa has the ability to split into two. Combined with the designs of her wings, and suddenly it looks like Flandre might have been inspired somewhat from this version of Marisa... or maybe she stole Yuuka's duplication from Lotus Land Story. 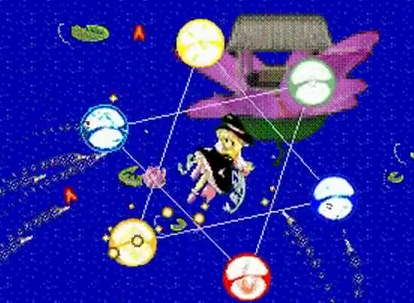 So; let's assume this is PC-98 Marisa going through one of her wing phases. And then the game progressed onto Reimu's part. Wait a second. This is CLEARLY Windows Reimu. It's worth noting this Reimu teleports; has attacks where she flies around rapidly firing; and even has a survival phase where she becomes a ball of light. Perhaps an early version of Fantasy Heaven? OK then, so when was this game released? OK, so where does this fall in the Touhou timeline? Right in the middle of Mystic Square and EoSD? So this makes Seihou the first appearance of Windows-Era Reimu, pre-dateng EoSD by almost 2 years? What's more; Seihou was on Windows. Not PC-98. So Reimu's redesign was intended, and completed, for at least 2 years before EoSD. The 2nd Seihou game was a vs danmaku shooter; with Yuuka as a guest character. And Yuuka is somewhere between Windows and PC-98. She has trousers like PC-98 Yuuka; but her hair is shorter than PC-98 but longer than Windows. Wings again. Interesting. 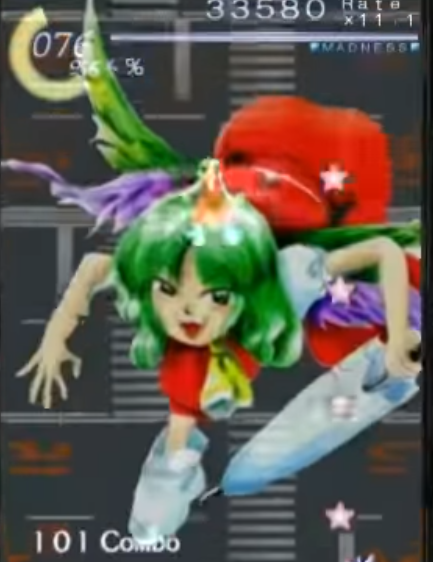 Yuuka has never been depicted with wings in Touhou. Yuuka retains her doppleganger however. 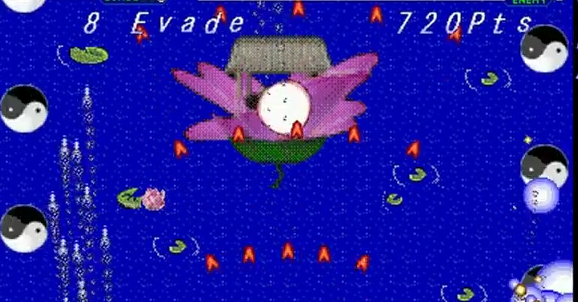 Also she seems to have 6 wings on her sprite. Also worth mentioning in this game she's slow and has a wide shot... sound familiar? 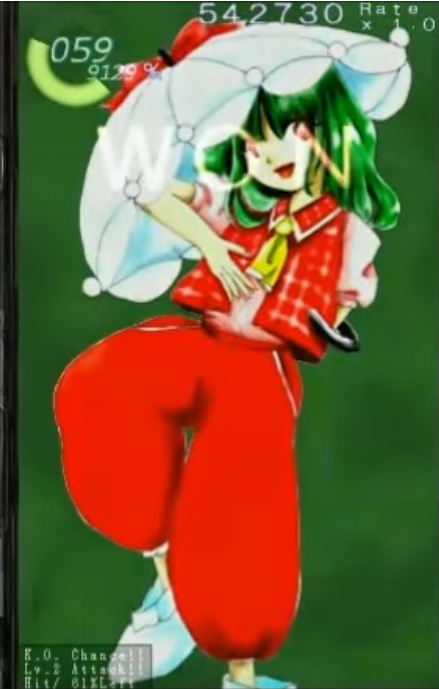 So we have Windows Reimu; a Yuuka who seems somewhere inbetween, and a Different winged Marisa. And this all occurs between the 1998-2002 gap in Touhou. Between the PC-98 and Windows bridge. I find this rather fascinating information regarding what directions ZUN was thinking about for Touhou between Mystic Square and Embodiment of Scarlet Devil. The fact Windows Reimu didn't originate in EoSD is a particularly interesting thing. Marisa in particular wasn't so ordinary, even at the time that Windows Reimu existed. It's also worth mentioning the only characters from PC-98 to return in Windows were Reimu; Marisa; Yuuka and Alice. And three of them appeared in Seihou in the gap between 1998 and 2001. And the fourth; Alice... well... it's Team Shanghai Alice. Bit of a co-incidence, that the survivors of PC-98 all had some sort of connection outside of the Touhou games themselves. I'm curious as to what you guys make of all of this. Or even how widly known all of this was. I don't see this topic brought up much; or this time period in Touhou. But yea, it's like a transition thing, experimenting and new idea, human are just like that with their creation. Pretty deep stuff. I actually never knew about Marisa having wings in Seihou. Maybe ZUN had some loose concepts down for the Windows era during SSG's development, so the characters who appeared there had experimental designs? Who knows. Though, Yuukass... he'll never live that down.